you to be a safe confident driver. 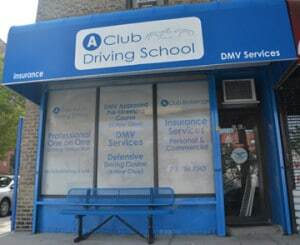 A-Club Driving School is certified and approved by the New York State Department of Motor Vehicles. It is our goal and our duty to provide top-quality driving instruction to both adults and teenagers. We have provided classroom and behind-the-wheel driver’s education, DMV services, and more to the residents of Sunnyside (Queens), New York since 1964. As one of the most experienced driving schools in the state, we are proud to offer competitive prices, convenience, and trustworthy DMV-approved services. We work with teens and adults to provide everything from full classroom learning and behind-the-wheel education packages to basic refresher coursers just in case you are a looking for a little extra experience. Do you have time to wait in line at the DMV? NO! Of course, not! (Who does?) 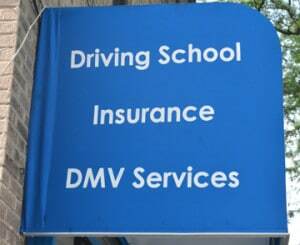 Even the DMV knows this, which is why we are one of the few driving schools in the state authorized to provide key DMV services, such as license plate services, registration renewals, Motor Vehicle License reports, and more. A Club Driving School online! Here you can find all the information you need about our school and we hope that you will email or call us with any questions you still have after visiting our site. Our driving school has been open since 1964, family owned and operated for the last 50 years. Our school is certified and approved by the New York State Department of Motor Vehicles. 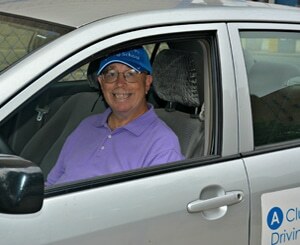 We offer driver training by qualified experts, insurance for both companies and the individual and DMV services. We have been open since 1964, offering driver training and both personal and commercial insurance for over 50 years. Our company is family owned and operated, completely committed to bringing you the highest quality services from the moment you walk through the door.